Naval Mobile Construction Battalion 11 (NMCB 11) is a United States Navy Construction Battalion, otherwise known as a Seabee Battalion, presently home-ported at the Naval Construction Battalion Center (Gulfport, Mississippi). The unit was formed during World War II as the 11th Naval Construction Battalion at Camp Allen on 28 June 1942. On 1 July, she moved to the new Seabee base Camp Bradford. Seabee battalions were numbered sequentially in the order they were stood up. The battalion lost one man during the war to an accident. The 11th NCB was inactivated on 1 December 1945, at Subic Bay, Philippines. The unit was reactivated as Mobile Construction Battalion 11 in the fall 1953, only to be decommissioned again in December 1969. However, MCB 11 made four tours in Vietnam. Eleven's fourth Seabee Technical Assistance Team (STAT) was sent to a Special Forces camp near the junction of two jungle routes, one called the Ho Chi Minh trail. It was the main route for the Viet Cong into South Vietnam, and lead to the most decorated group of Seabees in Seabee history. The battalion's 1967 tour exposed the men to the most severe combat the Seabees had seen since World War II. They came under fire 128 times, costing them 12 KIA. There were construction fatalities as well. In addition, the battalion suffered 102 wounded. NMCB 11 had one man make all four tours, getting a ribbon that matches the battalion's battle streamer. The battalion was deactivated in 1969. From Camp Bradford, the battalion caught a train to the Advance Base Depot, Port Hueneme. NCB 11 was the very first CB to embark from that port for the Pacific. In the early record, 11th's first assignments are referenced by their code-names: Straw-hat, Straw-stack and Fetlock. "Straw-hat" was Upolo, Samoa, "Straw-stack" was Tutuila, Samoa, and "FETLOCK" is believed to be Pago Pago. Eleven's primary projects were the construction of a Destroyer base and harbor facilities at Tutuila, fuel tanks, pump system, and fuel dock. A detachment was also sent to assist the 2nd NCB on Upolo. From Samoa, 11 NCB was transferred to Nouméa, New Caledonia after CBMU 506 arrived to replace them in Samoa. The main project on this site was Naval Mobile Hospital 5. There were 3 detachment sites: Magenta, Ducos, and Ile Nou. They were then sent to New Zealand for R&R. The next stop was Banika Island in the Russells for the building of the Acorn 3 dock. Afterwards, the battalion boarded USS Wharton (AP-7) for the Admiralty Islands campaign to build a home-base for the 2nd NCR on Los Negros Island . Also with them on AP 7 was the 58th NCB. At Milne Bay, Los Negros 11 CB and 58 CB joined the 71st CB. Projects the 11th CB had were the construction of three repair bases on Seeadler Harbor for seaplanes, landing crafts, and ships (FIG.3). From Los Negros, the battalion returned to the States. After a long wait, the 11th CB shipped out along with the 35th and 80th (segregated) CBs for Subic Bay, Philippines. At Subic Bay, the 11th took over some projects that the 115th CB had started as well as co-worked with the 115th on others. These included the completion of an Amphibious Training Center, Advance Base Construction Depot and a marine railway. On 1 December 1945 the battalion was inactivated. The record does not give the date that the men reached CONUS. 11 NCBs original WWII Log and documents are at the NHHC-Seabee Museum website (click on "Naval Construction Battalion"). AP-7, formerly SS Southern Cross, was one of the ships used by Admiral Byrd in his Antarctic exploration prior to the war. The battalion published a cruisebook when it returned to CONUS in 1944 titled "Southern Cross Duty". The inspiration for that name came from the history of USS Wharton as fitting to the battalion's duty sites south of the equator. In August 1953, the battalion was reactivated as Mobile Construction Battalion 11 (MCB 11) at Port Hueneme, CA. The battalion did not deploy to Korea. Instead, her first deployment returned the battalion to its last World War II duty station, Subic Bay. The project was constructing Naval Air Station Cubi Point with its adjacent pier. Along with CBs 2, 3, 5 and 9 MCB 11 was involved in the leveling of a mountain that civilian contractors said could not be done. It cost of $100,000,000 in 1956. Adjusted-for-inflation, the cost in today's dollars would be $934,229,168.10. In November 1955 MCB 11 landed on Kwajalein to build Department of Defense housing totaling 78 buildings. On Halloween 1959, the battalion relieved MCB 9 on Okinawa. The job was building base infra-structure: five 100'x400' warehouses, four shops, plus supply and administration buildings. Sent to Midway Island in December 1961, the battalion worked on a seaplane ramp, the station's roads, as well as civilian and military housing. However, MCB 11 had three atypical projects for the Atomic Energy Commission on Kwajalein, Eniwetok, and Nevada. The battalion repaired massive damage caused by the 11 November 1962 arrival of Typhoon Karen on Guam; an advanced party left for the island just days after the storm on 15 November, followed by the main body on 5 December. 1965 in late January, the battalion made history when it deployed to Okinawa. MCB 11 was the first CB to deploy by air. In February, Seabee Technical Assistance Team 1104 (FIG. 6) was sent to Ben Soi, Vietnam where they built a camp for U.S. Special forces. "Seabee teams with Secret Clearances were sent to Vietnam to assist the U.S. Army's Special Forces in the CIA funded Civilian Irregular Defense Group program (CIDG)". In June the program gave STAT 1104 another Special Forces assignment, construct a new camp at Dong Xoai. Nine of the team-members departed Ben-Soi to join Captain Bill Stokes (5th Special Forces Group) commander of the 10 men of team, A-342 at Dong Xoai. The camp had two adjoining compounds: The Green Berets, Seabees, and 200 odd Montagnards(CIDG) were in one, while 200 plus RVN Army were in the other. On the night 9 June the camp was attacked by over 2000 Viet Cong, beginning what is now called the Battle of Dong Xoai. The combined Green Beret Seabee force lost 3 men, 16 were wounded and one was unscathed. Nearly all of the RVN Army and Montagnards were casualties. Steelworker 2nd class William C. Hoover became the first Seabee to lose his life in Vietnam. Though already wounded twice, CM3 Marvin Glenn Shields helped retrieve a badly wounded Stokes and then volunteered to carry ammo for 1st Lt Charles Q. Williams assault on a machine-gun position. They took that gun out but both were wounded again returning to their positions. For Shields it was fatal. Both men received the Medal of Honor for their actions.The next day, nearly out of ammunition and under heavy fire, the survivors were extracted at 1300 by three Hueys and a gunship from the 118th Aviation Company. Except, LTJG Peterlin and EOC McCully had gotten separated from the others and were left behind while Dong Xoia was declared a free-fire zone. Both men survived the night and were awarded Silver Stars. The other team members all received Bronze Stars with Vs for valor. Every man received a Purple Heart and the team received the Navy Unit Commendation. CM3 Shields is the only Seabee to ever be awarded the Medal of Honor. The Seabees named their base on Okinawa "Camp Shields" in his honor. They also named their base in Da Nang for SW2 Hoover. 1966 1st Tour: Battalion deployed to Camp Adenir at Da Nang from February–October. John Wayne paid the battalion a visit in June to dedicate the enlisted-men's club. 1967 2nd Tour: This time the battalion went north to Dong Ha USMC Combat Base, just 13 miles south of the DMZ. There, they came under enemy fire 128 times that resulted in 5 KIA and 52 purple hearts. 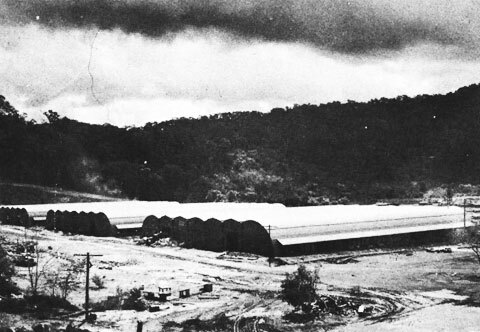 Eleven's first causality was Senior Chief Barnes and the Seabee Camp at Dong Ha was named for him. The battalion saw the most severe enemy fire experienced by any CB since WWII while on this tour. The primary projects were the air field at Dong Ha Combat Base, CB Camp, and twenty eight 50-foot observation towers. The battalion had too many other projects to enumerate here. During this deployment, an urgent airfield was needed at Quảng Trị. Battalions 1, 3, 4, 7, 11, 74, 121, and 133 all sent detachments of men and equipment to get the job done. 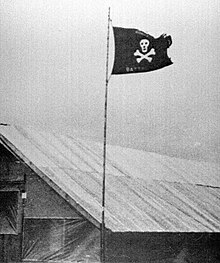 Those detachments dubbed themselves the "Ghost Battalion" and chose the Jolly Roger for the Battalion's colors (Fig. 8). The Ghost Battalion was disbanded 1 November 1967. 1968 3rd Tour: Quang Tri air base. The battalion made history in just getting to Vietnam. They were the first CB to deploy by air to the theater. The first couple of months saw the battalion living in tents pitched on sandy soil that did little for morale. There were a number of "High Priority" projects, starting with an Ammunition Supply Point. A "Minimum Essential Requirements" project (MER) for camp upgrades in the Quang Tri Combat area for the Army, Navy, and Marine Corps was also on that list. The project lead was NMCB 11, augmented by 200 man detachments from CBs 1, 10, 71, 74, and 133. The MER project was to build over 2000 basic structures to get "ALL" U.S. troops out of the sand and under cover before the next monsoon began. Another "High Priority" was roadwork on Rt 1, the length of Vietnam. In addition to NMCB 11, CBs 1, 4, 7, 8, 53, 58, 62, 71, 74, 133, and 138 all worked concurrently on the route. 1969 4th Tour: On this deployment, the battalion had three main deployment sites: Vietnam, Okinawa and Guam. In Vietnam the main projects were roads and bridges. One was the destroyed railway bridge at Song Bo. There, the crew came under enemy fire that attempted to stop the repairs several times, earning the men the Navy Combat Action Ribbon. Another bridge was on Route 1 at Bau Phu. NMCBs 1 and 11 did the construction work while 128 and 133 provided material support. On Okinawa, the battalion was on the island when Typhoon Cora passed with its 175 knot winds. NMCB 11 assisted in the recovery there. The Battalion returned to homeport to be decommissioned in December. See the MCB 11 Association website for a detailed account of this period and complete listing of all construction done. NMCB 11 was recommissioned on 14 September 2007 in order for the Naval Construction Forces (NCF) to carry out the increasing construction projects it was being tasked with throughout the world. Eleven was classified as the first "SMART Battalion", and instituted many of the initiatives and changes being implemented to improve NCF operations. According to the battalions webpage, "NMCB ELEVEN is tasked with providing advance base construction, battle damage repair, contingency engineering, humanitarian assistance and disaster recovery support to our fleet and unified commanders." 2010: The battalion had a deployment of civic action projects. One of these took a year to plan and three months to execute. This was the drilling of 3 wells in Cambodia for the Pacific Partnership 2010 in partnership with the hospital ship USNS Mercy (T-AH-19).(FIG. 15) NMCB 11 also went to the aid of the U.S. Agency for International Development (USAID) offices in Timor-Leste. In June NMCB 11 broke ground a Community center in Timor-Leste as part of Exercise Crocodilo, a Marine Corps exercise conducted by the 15th Marine Expeditionary Unit (MEU). 2012: The battalion deployed to FOB Camp Leatherneck in Helmand Province, Afghanistan. Work there was primarily in support of the Marine Corps and Special Operations Forces (USA). Much of this work took the form of building FOBs. There were also a fair number of civic action projects. 2012: After Hurricane Sandy, NMCB 11's Air-Det was sent to New Jersey and New York for two weeks. 2015: Deployment projects were carried out in support of OEF, as well as force protection, camp maintenance at various camps and civic action. Like most CBs, 11 does not use the unit insignia from WWII (Fig. 2). When the battalion was reactivated the first time, a pair of dice showing eleven was adopted for the unit insignia (Fig. 11). That design had no Seabee on it. The cover of the 1955–56 Cruise-book has an insignia on it exactly like the one used today, minus the phrase "Remembering the Past". For an unknown reason, the dice were removed from the unit insignia on the cover of the 1969 cruise-book. Navy "E" Ribbon : – U.S. Atlantic Fleet Battle "E" (6) times. Campaign and Service Awards |Vietnam Service NMCB 11's Battle Streamer for Vietnam has one silver star and two bronze stars: the streamer alone counts as the first award. MCB 11 made 4 tours of Vietnam. The conflict was divided into 18 award periods and the battalion qualifies for eight. Complete Seabee Teams Report by: Commander Naval Construction Battalion U.S. Pacific Fleet, Tân Sơn Nhất, Republic of Vietnam, Completion Report 1963-1972. ROICC Okinawa Award – 1964 "Contractor of the Month". June 1964, First time that this award was given to a Seabee battalion prior was only presented to civilian construction contractors. CDR John P. Williams Feb 1960 – Mar 1962 NS Subic Bay Philippines "
CDR Paul J. Doyle, Jr Mar 1962 – Apr 1963 NS Subic Bay Philippines "
In 1968 the Marine Corps requested that the Navy change its use of "MCB" for Mobile Construction Battalion as the Marine Corps were using "MCB" for "Marine Combat Base". The dual usage was creating confusion in Vietnam. The Navy agreed there was an issue and changed the Navy's CB name format. The USN from "United States Naval" Mobile Construction Battalions was changed to U.S. and the N was moved to the "MCB" creating the "NMCBs" that exist today. ^ The Pacific War Online Encyclopedia: "U.S. Reinforcements 1941–42"
^ a b c d Naval History and Heritage Command,U.S. Navy Seabee Museum web page, Port Hueneme CA. ^ This Week in Seabee History June 10 - June 16, Seabee Museum, Port Hueneme Ca. ^ This Week in Seabee History June 3 - June 9, Seabee Museum, Port Hueneme Ca. ^ MCB 11 cruisebook 1964-65, p. 66/102 Seabee Museum Archive, Port Hueneme, Ca. ^ U.S. Navy News Service Website, Story Number: NNS100827-09Release Date: 27 August 2010 9:01:00 AM, 1200 Navy Pentagon, Washington, DC., "USNS Mercy Marks End of Pacific Partnership 2010 Involvement"
^ U. S. Navy News Service website, Story Number: NNS100518-08Release Date: 18 May 2010 5:10:00 PM , 1200 Navy Pentagon, Washington, DC. "Seabees Assist USAID in Timor-Leste"
^ U. S. Navy News Service website, Story Number: NNS100702-06Release Date: 2 July 2010 10:23:00 AM, 1200 Navy Pentagon, Washington, DC. "Joint Effort Leads to Success in Timor"
^ U.S.Navy Website: "NMCB 11 completes disaster recovery Mission"
Wikimedia Commons has media related to Naval Mobile Construction Battalion 11. B29 "Lucky leven" no records have been found indicating that this was or was not a " seabee sponsored aircraft"
This page was last edited on 11 April 2019, at 23:04 (UTC).